Bruins fans were shocked in June when star goaltender Tim Thomas announced he would be taking the year off from hockey in order to spend more time with his family. Some people became angered by this, which is a bit shallow. You need to respect Thomas for his decision. He's 38 years old, and he's not getting any younger. As a goaltender in the NHL, you have very little time to spend with your family, and Thomas felt that little bit wasn't enough. Today, Bruins fans waved goodbye to Thomas as it was announced that he had officially been traded to the New York Islanders. In return for Thomas, the Bruins received a conditional second round pick in either 2014 or 2015. The trade was mostly a cap-related one, with the Bruins trying to clear salary, and the Islanders trying to add some in order to stay above the salary cap floor. Thomas had a year left on his four year, twenty million dollar contract that the Bruins no longer have to worry about (even though they didn't have to pay him anyway). Thomas will also remain suspended by the Islanders, as he was with the Bruins. This means the Islanders, like the Bruins won't have to pay him. His salary still counts toward the cap since he is above the age of thirty five. Bruins general manager Peter Chiarelli had nothing but good words about Thomas, who's record breaking Vezina performance led the Bruins to their Stanley Cup victory in 2011. Assuming Thomas doesn't return this season, not much will change for either team this year. Plus, nobody is truly sure whether he will come back next year, and if he does, he may be a free agent. The Islanders will have until June 5 to decide whether to let Thomas go on to free agency, or to keep him and his contract for one more year. Thomas ends his very successful career with Boston with 31 shutouts, enough to rank third all time for the Bruins, and 196 wins, which ranks fourth. 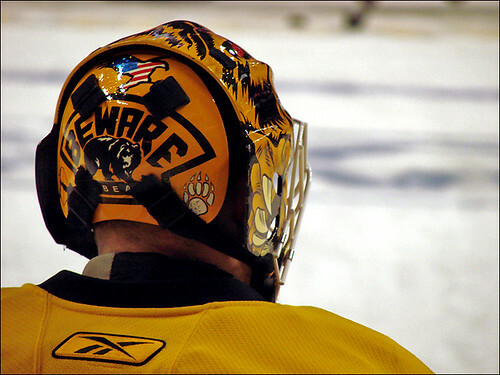 He also leaves with a 2.48 goals against average, and a .921 save percentage, tallying in as the fourth all time Bruins goaltender, according to NHL.com. But what will really be remembered, is his outstanding 2011 season Thomas had a fantastic season, winning the Vezina, and carrying the Bruins to a Stanley Cup victory. So now be bid farewell to Thomas, who in our hearts, will always be a Bruin. "Beware of Bear"